Browsing on the web last week I came across a company called SheerSEO, and I was impressed with the SEO software that they created. It basically packs a wide range of SEO tools on a single user interface. If you are trying to get your website ranking well in Google, tracking your performance along the way is vital. Ever heard the saying “You can’t improve what you can’t measure”? Well, it is true. The service is also not that expensive, with the basic plan starting at $7 per month. On top of that you can also try it for 90 days free of charge. We will give it a run and report back to you guys how it will work out. I tried SheerSEO and it was ok. Lot’s of features but some of the results were off. 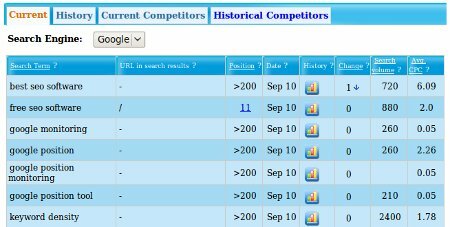 I’m now using another online seo monitoring program called http://www.MasterSiteManager.com to track SEO results. It’s a bit more expensive but so much easier to use. SheerSeo has a great Rankings section that actually gives very useful information. For those who are searching for free seo tools, like am I, there is a web based seo tool that I just recently found: http://tutor.rs – provides very detailed website analyze and gives useful tips for improving.